Thick-gray clouds on an early Thursday, hanging-low along California’s north coast — might be more fog than cloud, sometime hard to reckon, but whatever, supposedly should be clearing fairly-quickly this morning. A new report from the Brookings Institution that examined recent Census data found that Americans are flooding to areas affected by drought. From 2000 through July 2014, the United States’ population surged by 45.2 million — 25.8 million or 57 percent of that growth happened in counties in some sort of drought, specifically areas in California and the Southwest. The Public Policy Institute of California’s poll found that 39 percent of Golden State residents believe the most important issue is “water and drought” — almost twice the 20 percent who are most concerned with jobs and the economy. 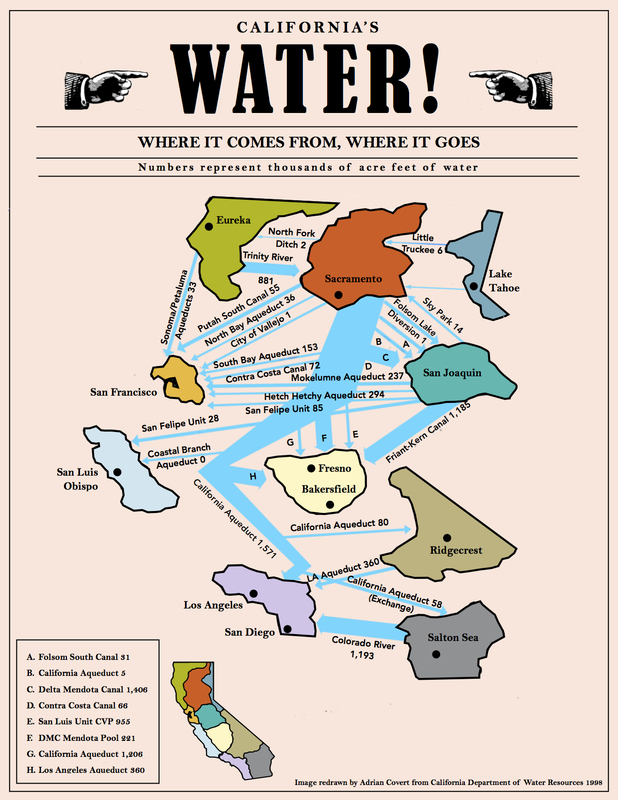 The concern varies widely by region: 53 percent of Central Valley residents mentioned it as the most pressing issue; 42 percent of Bay Area residents did so; and only 31 percent did so in Los Angeles, which is reliant on water brought down from Northern California. And only 28 percent say people in their part of the state are doing enough to respond to the drought, while 60 percent say their neighbors are not doing enough. “There’s still a lot of belief out there that it’s up to the other people in the region to do more than they’re currently doing,” said Mark Baldassare, the PPIC’s president and CEO. Almost half of Californians — 47 percent — approve of Brown’s handling of the drought in general, while 38 percent disapprove and 15 percent say they don’t know; among likely voters, 44 percent approve, 47 percent disapprove, and 10 percent don’t know. In this fashion, folks will become more acquainted with those couple of ‘words‘ exacerbating California’s drought — climate change.